VBus®Touch. It is a software especially designed for the Apple iPhone and iPod touch. 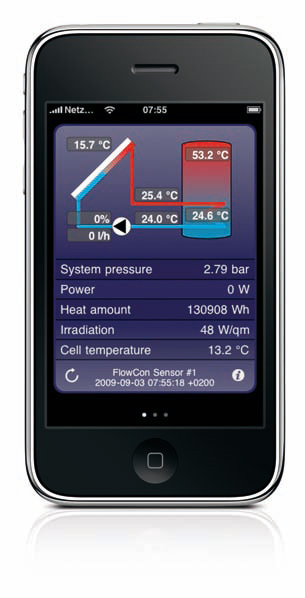 It displays both live data and a progression chart of the solar system at any place in the world, provided that the system is run by a RESOL controller equipped with a VBus® interface and a datalogger connected to the Internet via LAN. RESOL Datalogger DL3 has 6 vbus connections, which allow a DL3 to log data from up to 6 different RESOL controllers simutaneously. Custom data views and six different schematic diagrams can be uploaded and presented online. Remote access and communication with BACNet system provide optimal solutions in monitoring system profermance and compability of existing BMS. All data can be transfered by a USB memory stick, a SD card or a LAN cable or downloaded online. As long as you have Internet, system remote control is at your fingertips! Currently, RESOL has introduced www.vbus.net - a FREE service portal that offers the possibility to access solar thermal system data, without any configuration effort, from all over the world. VBus.net enables users to access their solar thermal system data from any computer connected to internet, just by using a regular Web browser. No additional software or app is required, only a registered account for the VBus.net service, a Web browser and an Internet connection. Of course, many mobile devices are supported as well. ServiceCenter's modular design enables PC-recording of the data measured by the controller, editing of the data files for further processing by standard spreadsheet programs and visualization of individual systems with all measuring and balancing values. 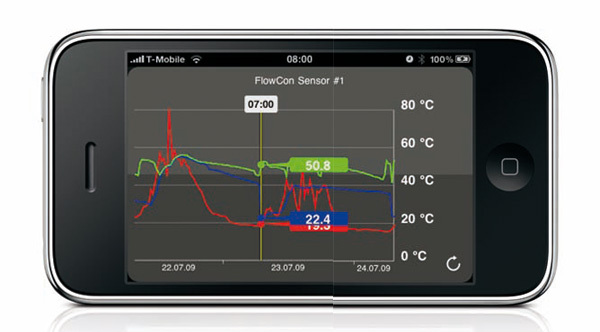 Datalogger: Manage any number of dataloggers; the ServiceCenter establishes connection at the push of a button, reads out the data, if necessary, deletes data from the logger and converts data into a text file. Parametrisation: DeltaSol® BS/1-4, BS Plus, ES, E, M can be easily configurated on PC; the values are checked on domains and possible overlappings are transferred by VBus® to the controller. The new VBus®/LAN interface adapter is the interface between the controller and a personal computer. It allows end users to access to their solar system by Internal Network. Data collection, controller programming and live data diagram are available at any of computer connecting to the Internal Network. The new VBus®/USB interface adapter is the interface between the controller and a personal computer. A standard mini-USB port it enables fast transmission of system data for processing, visualizing and archiving as well as the parametrization of the controller via the VBus®. A full version of the RESOL ServiceCenter Software is included. The RESOL VBus®/ PWM interface adapter enables the speed control of two high-efficiency pumps even without an integrated PWM output on the system controller. The adapter is installed between the VBus® output of the controller and the PWM input of the high efficiency pump, where it transforms the VBus® data packets into a 0-10 Vor a PWM signal.